Abstraction is the concept of exposing only the required essential characteristics and behavior with respect to a context. When do you use Abstraction? Abstraction in Java or Object oriented programming is a way to segregate implementation from an interface (hiding internal details and showing functionality) and one of the five fundamentals along with Encapsulation, Inheritance, Polymorphism, Class, and Object. For example: phone call, we don’t know the internal processing. 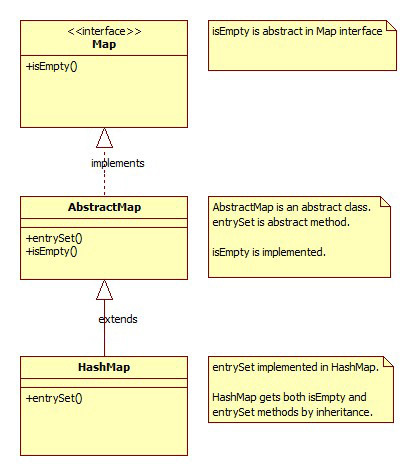 Abstraction in Java is achieved by using interface and abstract class in Java. An interface or abstract class is something which is not concrete, something which is incomplete. Ex: when creating a class called Vehicle, I know there should be methods like start() and stop()but don’t know how that start and stop method should work, because every vehicle can have different start and stop mechanism e..g some can be started by kicking or some can be by pressing buttons. So the implementation of those start() and stop() methods should be left to their concrete implementation e.g. Scooter, MotorBike , Car etc. Common behavior can be elevated to a super class and provide implementation to it. Then add behavior that cannot be implemented and declare it as abstract. Classes that are similar to this abstract class will extend it and use the already implemented methods and add implementation for abstract methods. In Java Interface is an another way of providing abstraction. Interfaces are by default abstract and only contains public, static, final constant or abstract methods. It is possible for an abstract class to implement a Java interface. If the implementing class does not implement all of the abstract methods from the interface, then this must be defined an abstract class in Java. Difference between an interface and abstract class is methods in an interface are implicitly abstract. So, Animal class does not implement the abstract method (getClassification) from Species interface. Though Animal does not have any abstract method on its own, it must be declared as abstract since it did not implement the abstract method from Species interface. Any class that extends the Animal class should implement the getClassification abstract method. This abstract class defines a constructor with an argument that is used to setup the field name. Classes that extends this abstract class should define a constructor with implicit super() call to the super abstract class. Otherwise we will get an error as “implicit super constructor Animal() is undefined. Must explicitly invoke another constructor”. This is to do some initialization before instantiation. Design principles “programming for interface than implementation” is based on abstraction and “encapsulate whatever changes” is based upon Encapsulation.